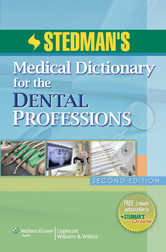 Be it dentistry, dental assisting, or dental hygiene, Stedman's Medical Dictionary for the Dental Professions, Second Edition is the go-to resource for all students and professionals in the dental field. This dictionary contains definitions for thousands of terms relevant to all dental professions, including dentistry, and includes hundreds of illustrationsâmost in full color. Appendices include tooth numbering systems; dental imaging errors; guidelines for infection control in dental health care settings; weights and measures; medical prefixes, suffixes, and combining forms; medical and dental abbreviations; abbreviations used in medication orders; laboratory reference range values; and professional organizations.